Unidentified Polish forces flag D-Day invasion. The Oct 99 issue of "Air Forces Monthly" clearly shows the new Polish Air & Air Defense Forces ensign (like the state ensign, with the AF roundel in the upper hoist), flying above a military airfield. According to the Ordonnance of the National Defense Minister dated 29 January 1996, relative to the use of symbols of armed forces of the Polish Republic and to other symbols used in the armed forces of the Polish Republic, this is the flag of the airports (of the landing grounds) of the military forces. The "roundel" is officially called (in French) "Échiquier d'aviation" (airforce chessboard?). This flag flies and must be lowered near the commanding office of the permanent and provisory military airports (landing grounds). There is also a similar flag for the navy: (flag for the airports (landing grounds) of the navy). It is the same but with a white anchor under the chessboard on the red stripe. The anchor has a white rope with it. The ratio length anchor:width flag is 2:5. This flag flies near the commanding offices of the permanent or provisory airports (landing grounds) of the navy. Source: Moniteur polonais, Journal officiel de la République polonaise, Varsovie, 28 Février 1996, #14. I saw the Polish Air Ensign flying at the War Memorial. If the Polish Airforce used it for this purpose it is probably their equivalent of an Air Ensign. After all the main place you see the Royal Air Force ensign is at Royal Air Force bases, and the UK civil air ensign is meant to be flown at civilian airports. This flag is entitled: FLAGA WOSK LOTNICZYCH I OBRONY POWIETRZNEJ. See also: Flag of the Navy, Flag of the Army. This flag is shown in The World Encyclopedia Of Flags (Znamierowski, p. 83). The insignia is actually a representation of the Polish Air Force's cap badge. 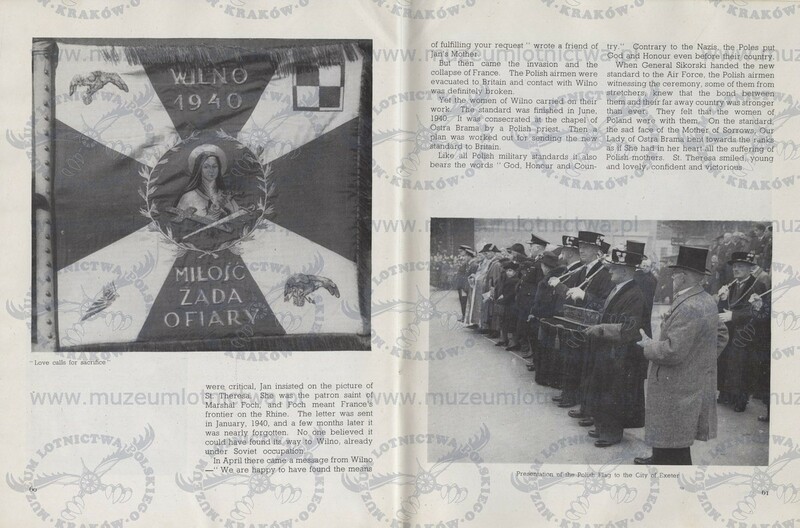 TWEOF shows similar flags for the Polish Army and Navy, both red with a representation of the appropriate cap bage. According to TWEOF, all three were adopted in 1993. This is the flag for military airports, taken into use in 1930. Ratio 10:21. This Soviet-inspired flag was officially adopted, but practically never used. Early days of Polish military aviation were in the chaotic situation of late 1918, and a situation in which each of three Polish airfield adopted its own marking. as reported by http://www.internetmodeler.com/cd-roms/RNP_CD/Poland/index.htm: " The national markings worn by the Polish aircraft went through many changes, in November and December 1918 had three different sets of markings? 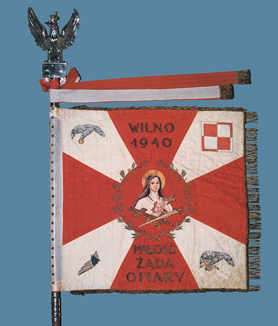 The first was the "Warsaw" (red/white shield) "Cracow" (red Z on white square) and "Lwow" (red/white tips of wing and tail). Each one had its own variations. " For Warsaw 1918, [cos98] show a diagonaly divided (top right to bottom left) white-red shield as wings, fusalage and rudder. The extra "1918" plate show black discs on wings, shield on fuselage (diagonaly devided from top left to bottom right) and diagonaly divided disc on rudder. I suspect that the black discs are not marking but was painted to hide the former German markings. Insignia (http://www.insigniamag.com/pol2.jpg) show for warsaw "Red and White shields are painted over the German fuselage crosses. The rudder carries a diagonally divided circle in Red and White" and in the other image (http://www.insigniamag.com/pol1.jpg) shields on fusalage and rudder on black plate [probably also to cover former marking). Note that both Insignia markings are diagonaly devided from top left to bottom right which doesn't mean neccesaraly the [cos98] is mistaken due the numerous variants that existed. For Cracow, [cos98] show red "Z" on white and this time Insignia agree (http://www.insigniamag.com/pol4.jpg) and report: "The insignia consists of a Red 'Z' on a White square, and appears on the fuselage, rudder and four wing positions"
"Officially, the Polish red/white checkerboard marking was approved 1.12.1918 but up until the end of 1918 "old" markings were used. Add to this special markings used on planes in Silesian Uprisings 1919-1921 (blue square on left wing and white on right - both with black outline). Another set of marking was used in 'Zeligowski's revolt' in Lithuania in 1920-21 - red square with white outline on left wing and white square with red outline on right." Those Silesian (1921) markings are reported also by [cos98] who adds a vertical blue-black-white rudder stripe. The 'Zeligowski's revolt' markings were already discussed under my LT review. Nevertheless, the new markings were of a chequred square (red in 1,4, white on 2,3) as appear in our <pl-afs18.gif> without the red outline. See http://worldatwar.net/chandelle/v2/v2n2/lvg_cv.gif. Year passed by and in 1920, the known Polish markings were adopted <pl-afs21.gif>. Red is in 1,4 and white in 2,3. In time and as rudders became thiner, the rudder marking became a fin flash. The change in Poland in 1993 brought to change in the marking by mirror it. White was moved to 1,4 and red to 2,3 <pl-afs93.gif> . See http://www.airliners.net/open.file/600733/L/. Somehow, [cos98] missed this evolution, and he show the two posibilities as "1920 onward". Polish Air Service - The White Eagles: Polish Aviation 1918-1920 - Polish Air Force - Naval aviation - The Polish Airforce 1918-1939 - http://www.scramble.nl/pl.htm. I am a stone mason in England and I am making a memorial to commemorate the different British armed forces that took part. I also have to include the flags (in use at the time) of these other countries that took part in this event - USA, Canada, Norway, Netherlands, and Poland. I believe the flag was diagonal red and white rectangles but can find no reference to it. Can you help? I believe he refers to the fin flash used by the Polish air force, which was *not* a flag, even if it does appear as an element in flags of the Polish air force. 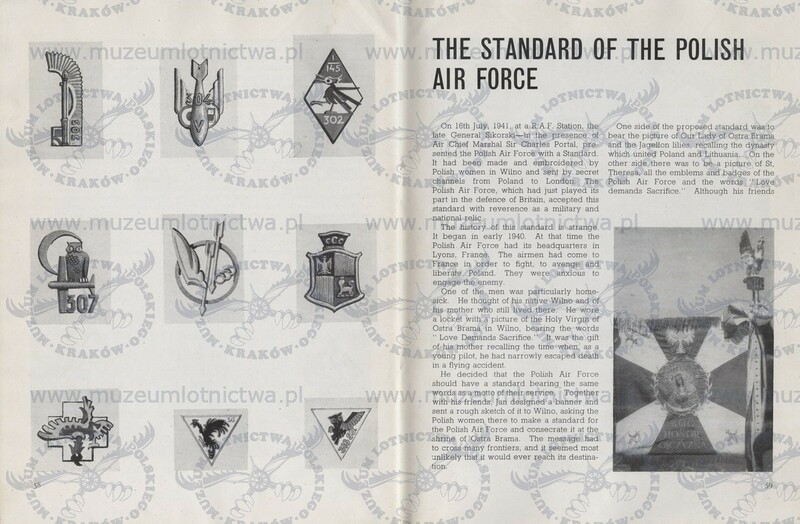 I just found an old book about the Polish Air Force: http://www.muzeumlotnictwa.pl/index.php/digitalizacja/katalog/1338 which mentions about a standard of the Polish Air Force (Sztandar Polskich Sił Powietrznych), created in 1940 and used from 16th July 1941 to 10th July 1947: here and here. More information about it here (scroll a bit) and here (only in Polish): And pictures here: here and here. The last source tells about the end of its usage (only in Polish). Maybe somebody here knows the language, in order to give better translations than Google. "Złożenie oznak i oznaczeń Sił Zbrojnych w Instytucie Historycznym im. gen. Sikorskiego nastąpiło na r ozkaz Szefa Sztabu Głównego w dniu 10 lipca 1947 r. Dowódca składający sztandar otrzymywał dowód złożenia sztandaru. Tekst polski podpisał Prezes Zarządu Instytutu prof. Stanisław Stroński, a tekst angielski Prez es Rady Earl of Elgin and Kincardine. W tekście oświadczają oni, „że będą Sztandar ten przechowywali w nal eżytej pieczy i postąpią z nim w zgodzie z władzami, które zarządziły złożenie go w Instytucie”." "Data 10 lipca 1947 — data złożenia sztandarów, jest symboliczną datą demobilizacji Polskich sił Zbrojn ych na Zachodzie."